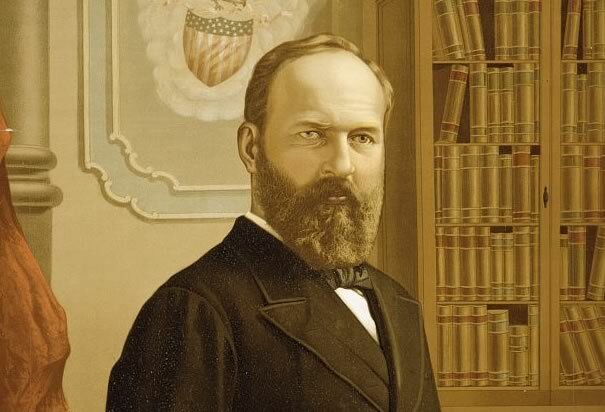 James A. Garfield, the 20th U.S. President, is known for not accomplishing much in his term. That's because he was only in office for seven months or so, and 11 weeks of that were him, laying in bed, dying. Why did he die? Poor man was assassinated. Why assassinated? Well, he made somebody with a gun MAD! In 1881, it was customary for the President to appoint people personally for certain roles in Washington. This was called patronage, and it meant that folks would hound the President for positions constantly. Garfield said of it, "These people would take my very brain, flesh, and blood if they could." Sounds like a prophecy to me, because Charles Guiteau got mad at Garfield for saying 'no' to a position he wanted, and so on July 2, 1881, he walked up to Garfield, who was waiting at the train station, and shot him twice. One bullet lodged in his chest. While Garfield lay in bed those 11 weeks, the doctors didn't know how to treat him because they didn't know where the bullet was, so they poked and prodded his body with unsterilized instruments looking for it. When they performed the autopsy, they found the bullet. I bet they were happy. The quote above comes from the fact that James Garfield wanted to have a strong gold standard. Nowadays, people quote this as part of anti-Illuminati/Big Bank philosophy. But that's a completely different story for another day. . . . Here are his Wiki Page;the Assassination Wiki Page; and some books about him and his assassination on Amazon. Source Articles: National Statuary Hall Collection: James A. Garfield; American Presidents Life Portraits: James A. Garfield; The White House Website-- About the Presidents:James A. Garfield; Alexander Graham Bell and the Garfield Assassination; Secret Lives of the U.S. Presidents, by Cormac O'Brien; BrainyQuote.